Quad introduces Vena II integrated amp with phono stage and DSD support | What Hi-Fi? The original Quad Vena integrated amplifier arrived on the compact-amp scene in 2014 as one of the more fruitfully-featured amplifiers of its then-£600 price, with hi-res support, Bluetooth and USB, optical and coaxial inputs. That was one of the reasons we awarded it a glowing four-star review. Naturally, such compatibility and connectivity has become more ubiquitous at this price point over the years. More pressure has been put on manufacturers to cater for the vinyl revival by including built-in phono stages, too. The new successor to the Quad Vena, the fittingly-named Vena II, brings an MM phono input onboard, then, in addition to DSD (up to DSD256) and expanded PCM (up to 32-bit/384kHz) file support and numerous internal developments. On the latter, the Vena II keeps the Class AB-type power amp but features an upgraded power supply. 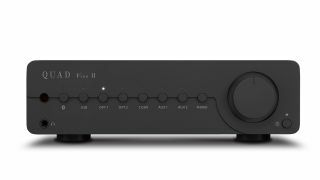 The new inclusion of the Sabre32 Reference ES9018K2M DAC introduces ESS Technology’s 32-bit HyperStream architecture and Time Domain Jitter Eliminator technologies, and Quad says op-amps in the post-DAC active filter’s circuitry have been specifically chosen for their synergy with the DAC. Rather than connect the headphone output to the amp’s main output stage, as the Vena did, the Vena II now incorporates a dedicated headphone amp, too, which should improve the sound quality you get through cans. The 31cm-wide chassis is familiarly characterised by a row of source-selection buttons and a large volume control, and is available as standard in ‘Lancaster Grey’ (£649) or in premium ‘Sapele Mahogany’, ‘Gloss Black’ or ‘Gloss White’ finishes (£749). The Quad Vena II will be available imminently - and can be bought with a pair of five-star Quad S-1 standmounts for a special price of £999, offering a saving of £150.